Does the thought of biting in to a giant squishy green caterpillar sound appetizing to you? It would if you were a chicken. The thing is, chickens love to eat bugs. The search for invertebrate insects is why chickens are constantly scratching the ground when they are allowed to forage on their own. They are hoping to uncover some juicy morsel. They are happy to make short work of any bugs that are thrown their way. I have had good results plucking Japanese beetles and tossing them to the chickens. 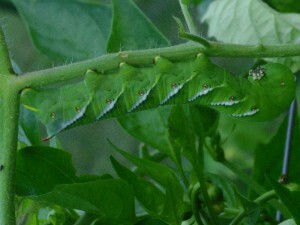 When the tomato horn worms made a second appearance in my garden this year, I knew just what to do with them. I served them up to my flock of chickens. For the hens, it was a real gourmet meal. I even served them up on a paper plate. I captured the event on video. Do you think chicken feed is a good use of tomato horn worms?